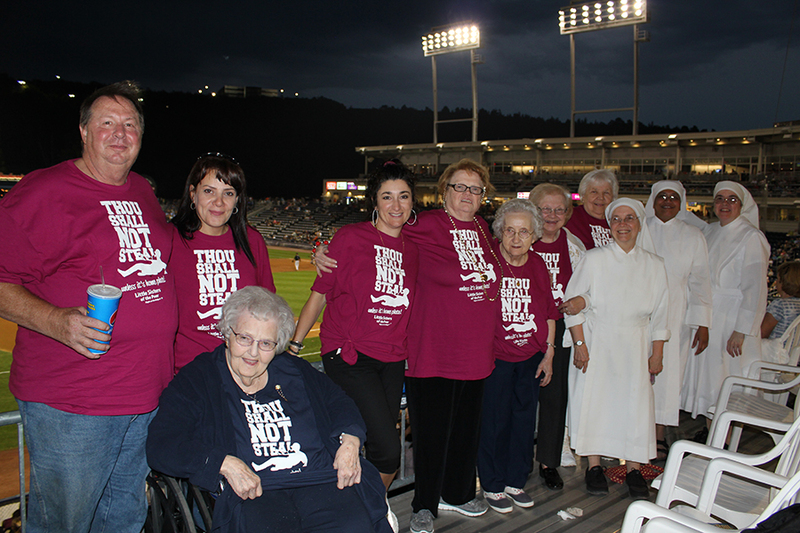 The residents of the Little Sisters of the Poor’s Holy Family Residence attended the fifth annual “Little Sisters of the Poor Night” on Tuesday, August 15, 2017 as the Scranton/Wilkes-Barre RailRiders faced off against the Gwinnett Braves, at PNC Field, Moosic. The residents, whose attendance was made possible through the generosity of benefactors of Holy Family Residence, enjoyed the festivities as well as hot dogs, potato chips, popcorn, cotton candy, soda, and water. Prior to the 7:05 p.m. game time, Sister Kathleen, l.s.p., provided an on-field interview about Holy Family Residence and the Sisters’ mission of serving the elderly poor throughout the world, and Sister Patrice, l.s.p., threw out a ceremonial first pitch of the game. Pictured are just a few of the residents and staff of Holy Family Residence who attended the fifth annual Little Sisters of the Poor Night at PNC Field, Moosic: seated: Alyce Farrell; standing: Rob DeSantis, Lourdes Pola, Lisa Torch, Karen Graham, Anastasia Chilek, Bernice Bullick, Henrietta Kaczmarczyk, Sister Kathleen, l.s.p., Sister Laurelliya, l.s.p., and Sister Patrice, l.s.p.